One of my auctions this past weekend used this silent auction entertainment idea. As the idea is fresh in my mind, it’s a perfect time to give you some pointers on using this concept. Also called “human statues,” the idea is that a person stands “frozen” until he receives a donation or otherwise wants to startle a passer-by. At that point, he changes his position. Here’s why I like this form of entertainment … and some tips on getting the most out of this investment. 1. 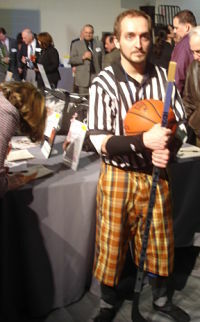 Unlike casinos, which physically and mentally take guests away from the silent auction, this form of entertainment works in and among the silent auction tables. 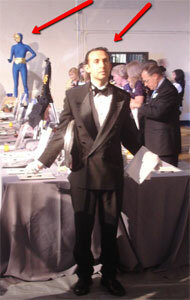 No guest leaves the silent auction to “experience” the entertainment. 2. If you prefer, the statues can complement your theme. 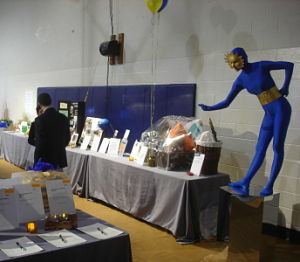 For instance, the Greek statue (see photo on right) was perfect at A Greek Odyssey auction. 3. They add a festive element to the auction without being disruptive. Guests will stop and watch them for awhile, sometimes posing for photos in front of them, before returning to chatting and bidding. 4. Living statues typically aren’t that expensive. 5. This concept will work for a wide variety of benefit auction themes. To get the most out of your investment, here are three suggestions. Have the actors stand on a platform or some sort of riser. When they aren’t elevated, they can get bumped by guests, or go simply unnoticed. The idea isn’t to have them remain “frozen” in the same position for the entire event. The statues draw attention when they move. This is particularly true if they change positions and the guest/s near them failed to comprehend that the statue was a human! (It’s happened even to me.) he startle factor is all in good fun — the actors never touch the guests — so it’s a clever way to keep guests interested, catching them off-guard. To be clear, silent auctions don’t need to have entertainment. You’re typically already providing food, drink, friends, and bidding. That’s plenty for a 90-minute segment! But for those galas seeking something low-key that fits in with even the most difficult of themes, human statues are an easy element to add.